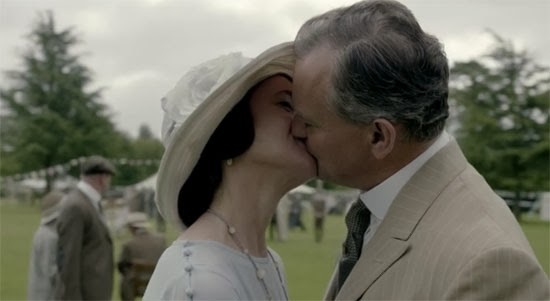 What a perfect night of Downton! This was easily my favorite episode of the season, chock-full of plot developments, romance, and great lines. The show begins with Mary, Tom, and Edith meeting with the tenant farmer about the pigs. He is handsome and kind, and Edith thinks about getting him to adopt her baby. Poor Edith is grasping at straws. 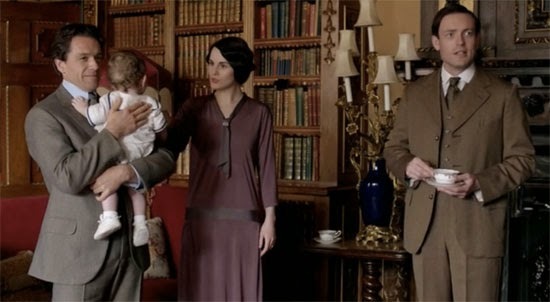 There is a lovely tea scene, with (to Carson's consternation) babies in the parlor. Mary learns that Blake likes babies when Blake reaches for baby George and holds him. While Tom is in town, he spies Rose flirting with Jack Ross at a cafe. 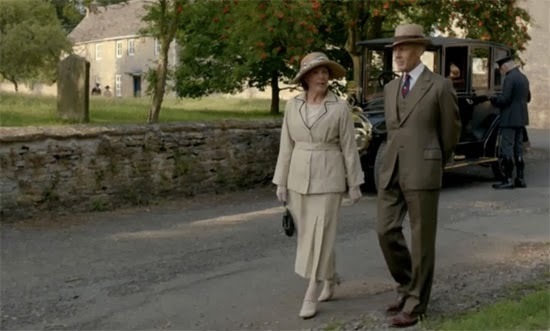 On the way back to Downton, Tom sees the young woman from last week's political rally on the side of the road. She has had car trouble and he stops to help. Her name is Sarah Bunting, and she is a school teacher in the village. She talks to him about his life with the Grantham family. It seems she distrusts the aristocracy, just as he did before he met Sybil. Tom tells Sarah: "I don't believe in types. I believe in people." 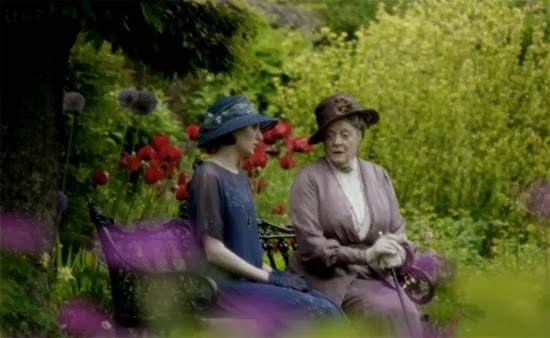 Rosamund comes to town to talk to Edith about the baby. She immediately shoots down the idea of passing the baby along to the tenant farmer. She suggests they vacation in Switzerland, so the baby can be adopted and raised there. The Dowager Countess gets involved in the plan. When Edith raises objections to her child being raised (horrors!) Swiss, the Dowager replies: "Switzerland has everything to offer, except perhaps conversation. And one can learn to live without that." There is yet more screen time spent on the (seemingly endless) Daisy - Alfred - Ivy love triangle. Alfred proposes to Ivy and she turns him down. 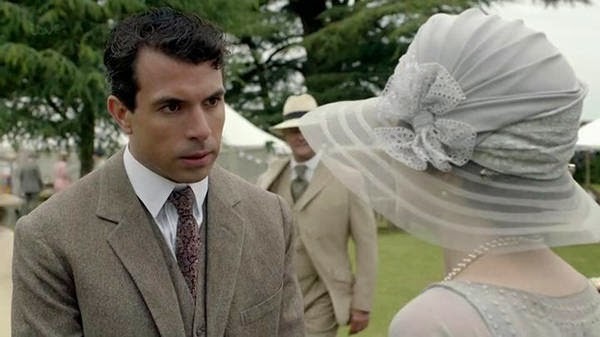 Daisy goes to see William's father, Mr. Mason, who advises her. When she sees Alfred and tries to part on good terms, Alfred declares his romantic interest. She turns him down. I think that after talking to Mr. Mason, she remembers how William loved her, and she wants to be loved like that again (as first choice, instead of being loved by default). Tom tells Mary about Rose and Jack. When Mary confronts Rose, she is defiant. She says they are engaged, but it appears the engagement is primarily to gall her mother. 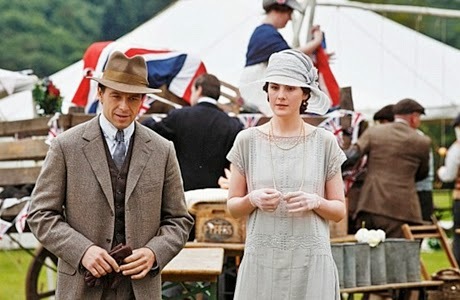 Mary goes to London with Anna, in order to talk to Jack Ross. He has already decided to break off the engagement. Mary and Jack have a nice scene together backstage at the theater. Mary also meets with Gillingham in London. She finds out he has broken off his engagement, and she does not discourage his interest. She asks him to fire his valet Green (who raped Anna), although she does not tell him why. 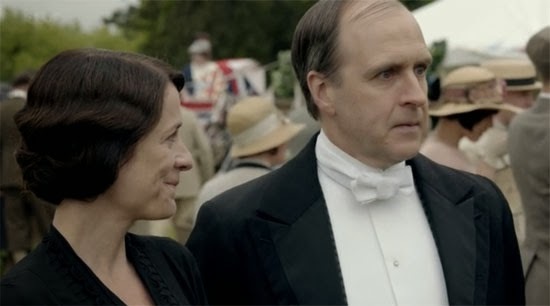 While Mary and Anna are away, we see Bates taking the day off and quietly walking away from Downton. He says he is going to York. 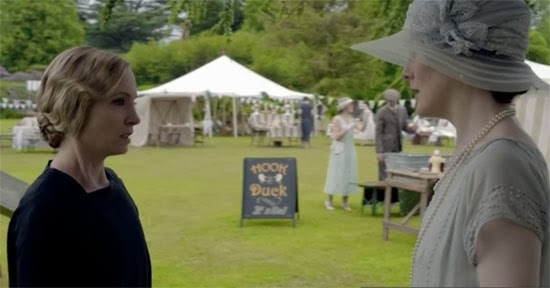 The Dowager Countess introduces Isobel to an old family friend, Lord Merton. There seems to be a mutual interest as they walk through the village. Later, Lord Merton sends flowers to both ladies. The Dowager seems miffed that her bouquet is smaller. 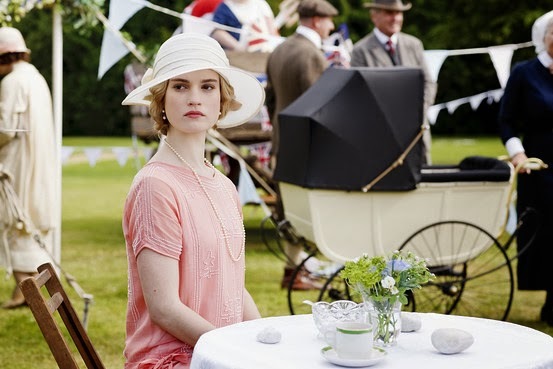 Downton Abbey hosts the village's annual church bazaar, all organized by Cora this year. Rose is still irked with Mary about Jack. Robert returns, weary of Prohibition, and delighted to see Cora. Gillingham arrives to see Mary. He tells her that his valet, Green, died suddenly when he fell into traffic and was run over. Mary relays this information to Anna. Romance seems to be in the air, as Baxter and Molesley have a flirtation. He shows off his strength with a carnival game. He defends Baxter against Barrow. Mary is surprised, and pleased, to see Blake. He throws his hat into the suitor ring. Blake and Gillingham leave together to drive back to London. Robert says: "What sort of ménage has that turned into while I've been away?" In a wonderful image, Rose, Edith, and Isobel lean forward to watch Blake, Mary, and Gillingham walk away together. What did you think of this week's show? Did Bates kill Green? Should Mary choose Blake or Gillingham? I would love to hear your thoughts in the comments, below. I think Bates did indeed kill Green, and he had it coming. I thought it was the best episode this season and it really covered a lot of ground, a bit like Alfred's letter to Ivy. I tend to agree that Bates probably killed Green, although of course I am not sure. It will be interesting to see if more comes out about this, although I personally hope that the show moves on and just lets Anna and Bates be happy for the 5th season.